In today's business environment, sustainable procurement practices are increasingly influencing companies' purchasing decisions, policies and reputation. We are committed to engaging and partnering with suppliers who are transparent, can assure us of responsible business conduct, and can verify compliance of their operations with our Responsibility Standards for Suppliers and relevant legal and regulatory requirements. Visibility and transparency in the supply base are mutually beneficial. Together with suppliers, we can maximize the value of collaboration to accelerate environmental and social improvements across our value chains, while mitigating risks and protecting our reputation. We strive to work with suppliers who share our values because we believe that business relationships are most productive and effective when they are built on trust, mutual respect and a common commitment to operating responsibly and ethically. We articulate our expectations of supplier business conduct in the Johnson & Johnson Responsibility Standards for Suppliers (Standards). All suppliers are expected to understand and comply with the requirements set forth in this document. We include elements of the Standards in Purchase Order terms and conditions, Contract Templates and Requests for Proposals, and take steps to assess our suppliers' conformance to them. In 2017, we completed a comprehensive review and update of our Standards to include enhanced requirements on quality, expanded requirements on human rights, and a new section focused on Health Care Compliance and Privacy. An internal cross-functional team coordinated the revision process to ensure that the updated Standards reflect growing internal expectations as well as external trends and benchmarks in responsible supply chain management. Our expectations of compliance with the revised Standards were communicated to all suppliers and Johnson & Johnson employees responsible for supplier relations. Reflecting the diversity of our supply base, our Standards have been made available in 13 languages. Online training for all impacted Johnson & Johnson employees about the revised provisions of the Standards has been deployed, and is mandatory for all new and current Global Procurement employees. It was rolled out in Q4 2017; we intend to report the completion rates next year. Encourage and support suppliers in achieving excellence by embedding sustainable social and environmental practices, including transparency, target setting and public disclosure, into their businesses and respective supply chains. We continue working towards our Health for Humanity 2020 Goal – to enroll suppliers covering 80% of spend in our program. To achieve this, we enroll suppliers to meet our annual targets, with 50% of our spend targeted in 2017. Suppliers within this target are required to participate in the program. The requirements for all enrolled suppliers are fully transparent, and are communicated through our Supplier Sustainability Toolkit, updated in 2017 and available on our corporate website. All participating suppliers must conform to our Responsibility Standards for Suppliers. We verify their compliance using the globally recognized EcoVadis platform. All suppliers complete an EcoVadis assessment upon enrollment to our program and in subsequent years, depending on their performance. We monitor EcoVadis score improvements and expect to see improvement over time. Achieve industry-specific goals, e.g., gaining certain certification, specific public reporting or delivering social projects. Enroll suppliers covering 80% of our spend in our Sustainable Procurement Program. 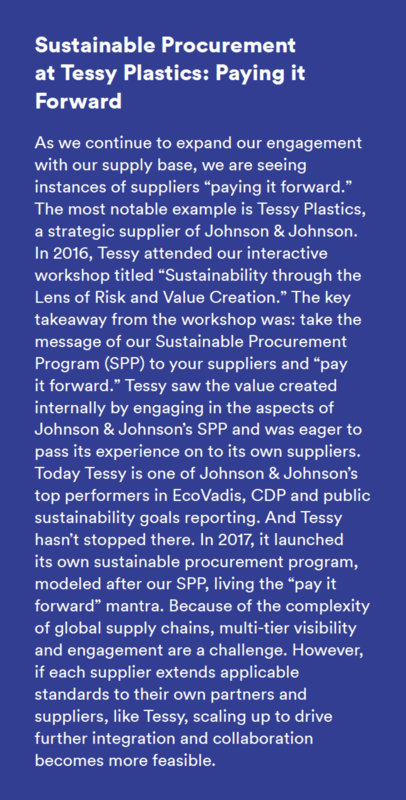 Enrolled suppliers covering approximately 51% of spend in our Sustainable Procurement Program. In 2017, to support the growth in supplier enrollment to the program and ensure global engagement, we established our internal Responsible Procurement Council with members from all procurement categories. The Council’s role is to align on the suppliers to be enrolled, set individual supplier goals and then drive global supplier engagement within each category through Global Procurement. Council members, who are category experts in the areas of citizenship and sustainability relevant to their suppliers, track and monitor supplier performance and report category results. 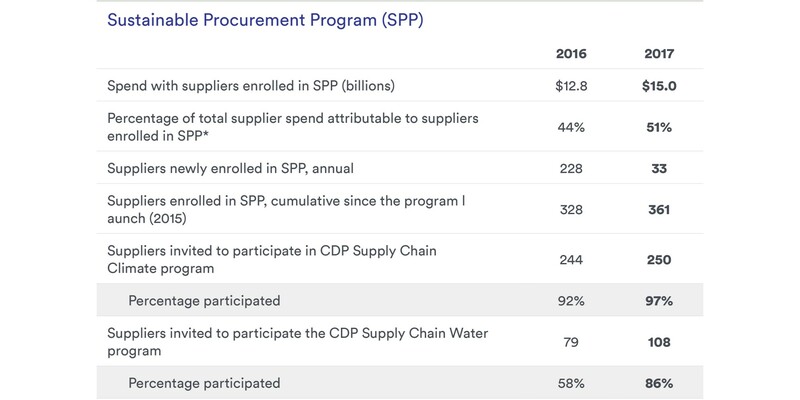 Year 2017 has been our most successful year for supplier engagement in CDP disclosure, with our highest response rates in Climate and Water programs reflecting the power of our global Council to engage with our supply base and deliver results. 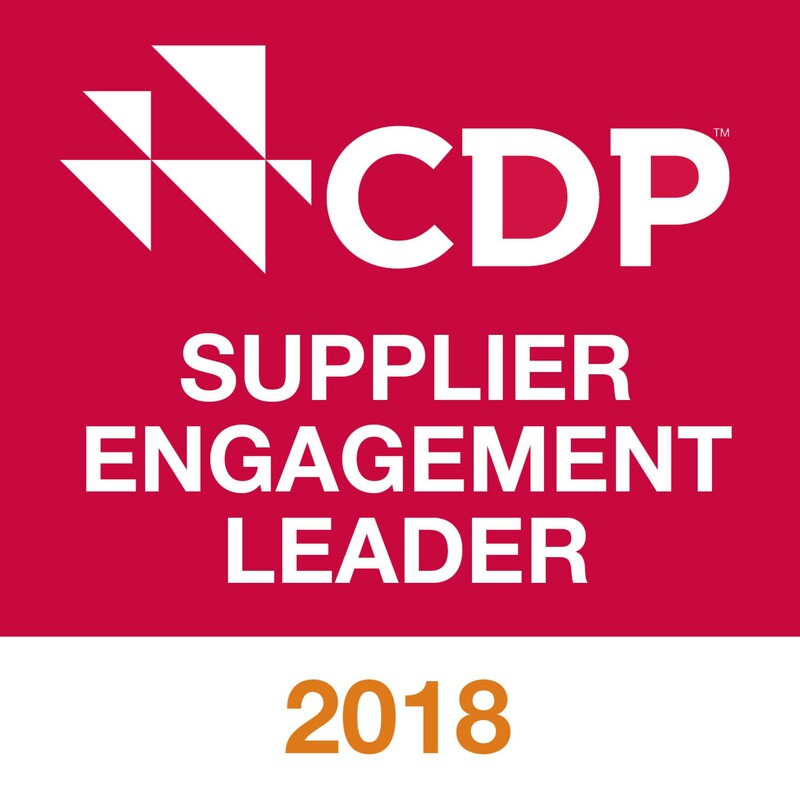 As a testament to our commitment to supply base transparency and engagement, Johnson & Johnson received an “A” in the CDP Supplier Engagement Rating. We are the first healthcare company to be admitted to CDP’s Supplier Engagement Leader Board.